Why Use Electrochemical Techniques for Corrosion Measurement? A broad range of electrochemical techniques have been developed specifically for corrosion measurement. Nevertheless, there are some Corrosion Engineers who don’t use electrochemical techniques…probably because they don’t understand them. Corrosion is caused by a redox reaction. Fundamentally, corrosion is an electrochemical process, so using electrochemical techniques is obvious. Corrosion is an inherently slow process. A typical corrosion rate is 10 milli-inches per year (mpy) or 0.254 millimeters per year (mmpy). The “best” corrosion tests are weight loss measurements after exposure. However, they are very slow (days, weeks, or months). Electrochemical instruments polarize the sample to accelerate the corrosion process and make the measurement in minutes or hours. The electrochemical corrosion rate is “instantaneous”. Electrochemical techniques can measure very low corrosion rates. A sample with a low corrosion rate will exhibit a low current during the electrochemical experiment. Corrosion scientists may use “corrosion rate” and “current” interchangeably. The best measure of a specific potentiostat’s ability to measure low corrosion rates is the lowest current range. 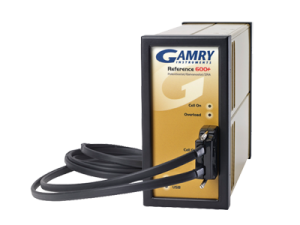 Gamry supports corrosion research with electrochemical instruments designed specifically for corrosion applications. 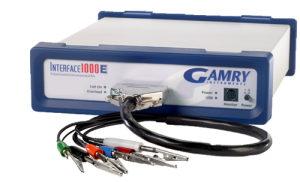 These instruments provide the highest level of electrical isolation. This means they are ideal for testing of grounded electrodes.